Omar, a 27-year-old cook originally from Deraa, the cradle of the Syrian uprising against Bashar Al-Assad, sits in front of the asylum processing centre in Traiskirchen, Austria, Oct. 13, 2015. After fleeing civil war, surviving a perilous sea crossing and trudging through several countries, Syrian refugees think they will receive basic food, shelter and fair treatment when they reach Austria. Most are right, but some tell a different tale. These people complain of coming under pressure to leave Austria for neighboring Slovakia and that if they refuse — or even simply miss the bus there — they can end up thrown out on the streets by a system they do not understand. Austrian authorities deny asylum seekers are forced to go to Slovakia against their will, but stress they cannot pick and choose where they are accommodated while their applications are considered. Whatever the rights and wrongs, Austria's already crowded asylum centers are struggling to cope with Europe's biggest migration crisis in decades. And the experiences of some Syrian refugees suggest that language barriers, misunderstandings and suspicions are aggravating the problems. In the past month, tens of thousands have moved smoothly onwards to Germany, the most popular destination for migrants. However, Austria also expects around 85,000 asylum requests this year — a similar level in per capita terms to Germany's. At Austria's main asylum center in Traiskirchen, about 20 km (12 miles) south of Vienna, overcrowding became so severe this summer that up to 2,000 people had to sleep outdoors. Eventually, the government agreed with Slovakia to send up to 500 asylum seekers to a former university campus in the Slovak town of Gabcikovo to relieve the strain. Getting people to that center, and to others in Austria, has not always gone smoothly. Omar, a 27-year-old cook from Deraa — the cradle of the Syrian uprising against President Bashar al-Assad — says he didn't know he was supposed to board a bus to Gabcikovo. And missing it left him homeless, penniless and without medical insurance. 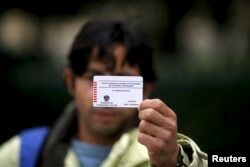 Omar shows the back of his Austrian migrant card in Traiskirchen, Oct. 13, 2015. From Turkey, Omar tried 11 times before he succeeded in crossing the Aegean to Greece. Several attempts failed because inflatable boats supplied by people smugglers were in danger of sinking and on one occasion, the engine ran out of fuel. Only rescues by Turkish police saved Omar and his fellow passengers from the fate of other migrants who have drowned making the crossing to the Greek islands. After making his way through the Balkans, Omar reached Austria on Aug. 20. He was brought to Traiskirchen, where he spent more than a month sleeping in a tent on the lawn. Chancellor Werner Faymann has acknowledged shortcomings in the asylum system and has said the authorities will ensure applicants are soon provided with accommodation suitable for the central European winter. Despite the discomforts, Omar got used to daily life at Traiskirchen. At 5 p.m. every day, he would go to what he calls "the sorting", when he said some asylum seekers were asked to sign a document for their transfer to longer-term accommodation. But on Oct. 3, an official informed Omar he should have been aboard a bus which left for Gabcikovo earlier that afternoon. "I've been wearing the same clothes for days," Omar told Reuters at a Turkish kebab shop in the town of Traiskirchen, pointing at his yellow jacket, soaked by the rain. His case is not isolated. Diakonie, an aid organization that offers free legal advice, has recently recorded about 200 instances a month of migrants like Omar who have fallen out of the "basic care" system because they missed their transfer, a spokeswoman said. Those people no longer receive the government's basic care package, currently provided to around 56,000 migrants, which includes accommodation, health insurance, food and 40 euros ($45) of pocket money a month. The Interior Ministry acknowledges that migrants fall out of the system if they miss their transfer, but a spokesman declined to say how many were affected. He said transfers to Gabcikovo were voluntary, but added that if asylum seekers do not take up a transfer to their allotted accommodation they forfeit their right to basic care, at least temporarily. "Everybody has the right to asylum of course, but nobody can choose which assistance facility they go to," Interior Minister Johanna Mikl-Leitner told Reuters this month. Few migrants at Traiskirchen understand documents in German, while the number of Arabic interpreters is not enough to keep everyone fully informed. In such circumstances, misunderstandings are common. Although the accommodation in Gabcikovo is temporary, migrants often fear they will be unable to return to Austria. They also worry they will get a hostile reception from Slovaks. "I don't know Slovakia. I saw a video that showed the people in Slovakia don't want refugees," said Omar, adding that nobody warned him he might lose his benefits if he missed the bus. Since then, he has moved around, sleeping outdoors, at the flat of a young man in Vienna who offered space to migrants, and in a church nearby, wrapped in a sleeping bag a friend smuggled out of the camp for him. A spokeswoman for the United Nations refugees agency UNHCR in Austria said the issue was not that asylum seekers get sent to one country while their claim is processed in another. "The only point which we view critically is that this must happen on a voluntary basis," she said. "If you don't want to go, you should not fall out of the basic care system." Fereydun Faruk Shahin, a 37-year-old pharmacist from Kobane in Syria, has been without basic care for weeks since he was thrown out of Traiskirchen after refusing to go to Slovakia without his family, who were still in a tent in the complex. "They just said why didn't you go to Slovakia? Verbally. That's it, you're out, you missed your transfer so you can't get back in," Fereydun said.